This Saturday is a pretty big deal for Houston! 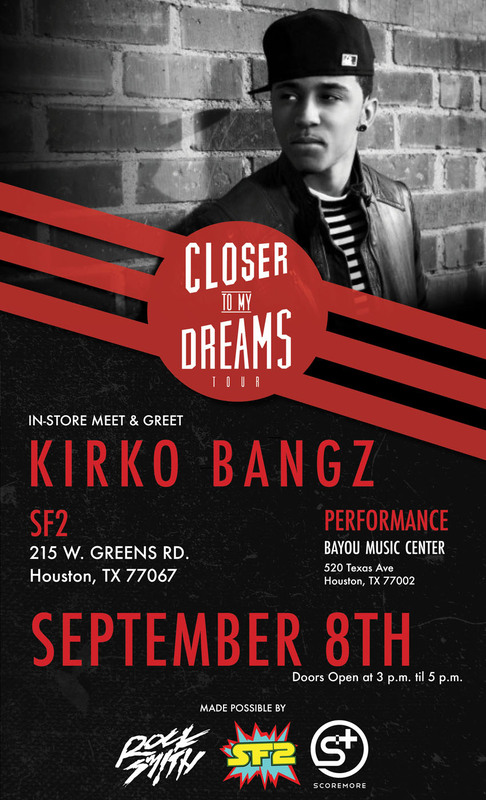 Kirko Bangz returns home with the Closer To My Dreams Tour presented by MTV JAMS, REEBOK and SCOREMORE. Plus he just released the much anticipated Mixtape PK4 today! Of course, KIRKO had to celebrate with SF2! We teamed up with our comrades from Rocksmith Clothing and Scoremore to bring the fans a special meet & greet at SF2 NORTH! BE THERE!!! We will have tickets for the show on sale as well as cool Rocksmith giveaways!